Apr.2017open! 15min from JR Kyoto sta. This is a townhouse type independent house located close to Horikawa Rokujo near Kyoto Station, which opened in April 2017. 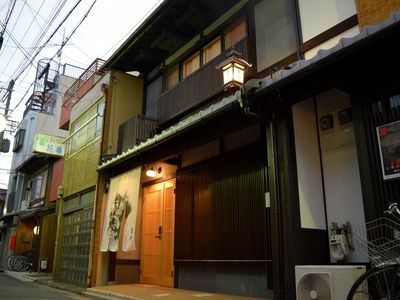 It is located in Sakana no Tana Dori (meaning Fish Shelf Avenue) between Nishi Honganji temple and Higashi Honganji temple which is said to have supported meals in the old capital back in the day. You can relax in the large living room that has a high ceiling through to the second floor. The kitchen has the traditional Japanese style dirt floor finish. The neighbourhood has many traditional Kyoto style townhouses in a tasteful location. 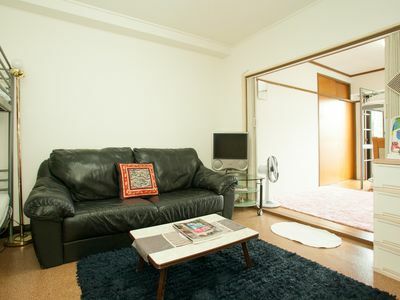 The rooms are: western style room (11.5 square meters), Japanese room (11.2 square meters), living room (20.9 square meters), Dining room (11.9 square meters). They are all spacious for you to relax. There is a double size bed and a single size bed in the western style room, and we prepared Japanese futons with mattresses in the Japanese room for you to recover from your busy travel. The bath room has a nice view of the Japanese courtyard. The courtyard is lit up beautifully in the night. There are cooking utensils such as cutleries and frying pans as well as table wares. So you can have memorable moments of cooking the local Kyoto food purchased in the Nishiki Market with your friends and family. There is a 50-inch TV in the living room suitable for your family relaxation time.